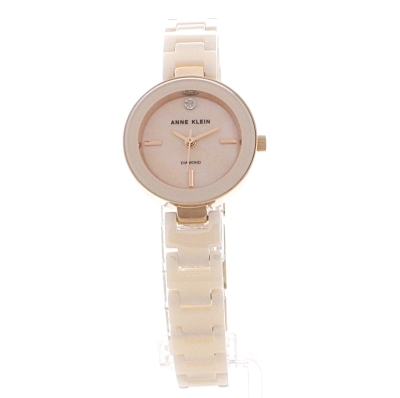 Anne Klein AK/N2660LPRG is a beautiful and trendy Ladies watch. Material of the case is Ceramic and the Pink dial gives the watch that unique look. We ship it with an original box and a guarantee from the manufacturer. Anne Klein watches are a part of the innovative and forward-thinking Anne Klein brand pioneered by the eponymous fashion designer in America in 1968. Synonymous with fashionable US sportswear for over half a century, the Anne Klein label works under the philosophy that the women who wear the clothes and accessories are those who will change the world. The Anne Klein label works in collaboration with a number of international fashion designers to produce a range of products that can be described as the 'elevated essentials' that will always be found to the front of the wardrobe, and this range of Anne Klein watches certainly fits the bill. Anne Klein watches have an elegant simplicity that never goes out of style and span intricate and delicate jewellery-based styles to more functional everyday wear. Meanwhile, the Anne Klein jewellery collection offers complementary accessories to complete your look. Watch Shop is an authorised Anne Klein stockist. Sign up to receive email updates when new styles of Anne Klein are added to Watch Shop!